G Oil Bath Air Cleaners - Vortox Air Technology, inc.
G series Oil Bath Air Cleaners are used in stationary diesel equipment that is exposed to heavy dust and oil such as excavating equipment, long-run gasoline or diesel units, and large dirt moving equipment. The G series is designed for service on engines and compressors where a clamped hose or flexible tubing connection is pre-existing. Equipped with a horizontal tubular outlet and provisions for an extended inlet cap, the G style is suitable for vertical mounting with the aid of a Saddle Bracket. Additionally, the customer receives a choice of rods or clamps to secure the oil cup. Both are cadmium plated to prevent rusting. 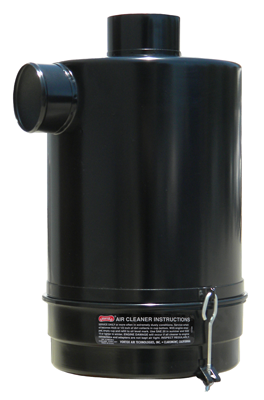 The G and GA styles of Oil Bath Air Cleaners are engineered for heavy use of large quantities. They are composed of four elements: the Body Assembly, Prefilter, Disc, and Cup. The Body Assembly houses the Vortox Air Technology filter element, which is made of finely coiled interlocking steel wire and sustains the life of the product. The continuous circulation of oil throughout the cleaner on a controlled basis from low to high air velocity creates a large dust holding capacity. The prefilter catches chaff and lint before it reaches the main filter and deflects the heavier dirt and oil into the Cup. The prefilter is also easily removable for quick servicing. The Disc controls the proper measuring and dispersion of oil from the Cup. The Cup serves as an oil and dirt reservoir. For more information on Vortox Air Technology’s G style Oil Bath Air Cleaners, read our Oil Bath Air Cleaner Press Release, Service Parts Lists, Service Instructions and Installation Instructions found under the Literature Section. Understand how they’re built and work by reading this post.